Sotheby's had a sale of antiquities in New York today. 102 lots were sold worth $17,479,938. A Cycladic marble figure (lot 14) sold for $446,500. It had surfaced in 1977 via Mathias Komor in New York. The Giuistiniani Athena head, estimated at $600,000 to $900,000, sold for $4,114,500. A Roman marble group of three satyrs fighting a serpent, estimated at $300,000 to $500,000, sold for $3,442,500. A Roman torso of a Julio-Claudian emperor, estimated at $800,000 to $1,200,000, sold for $7,362,500. The Sotheby's results dwarfed those at Christie's yesterday (at $8,694,375) and with fewer lots (and no adverse publicity as far as I am aware). 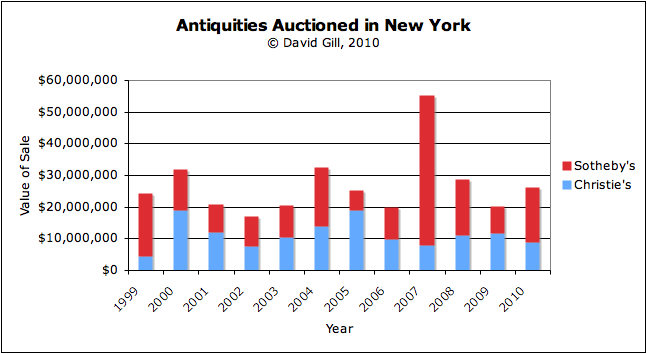 The half-year results for both auction houses have now outstripped the whole of 2009 (and are very close to the whole of 2008).